Alzheimer’s can be a devastating disease, and it is something that no one wants to ever go through. However, if you have a loved one or if you know someone that is suffering from this disease, they can get the treatment they deserve at Bradford Place! We are one of the best assisted living facilities in Benchmark Court Swansea IL, and we have a wide range of different services that are designed to ensure that your loved one is able to receive the best care possible at all times. We know how hard it is to live with Alzheimer’s, and we know how hard it can be to take care of someone with this horrible disease at home. This is why we are offering many different kinds of services that are designed to help people with this condition live life to the fullest! Our assisted living facilities are fully equipped to ensure that your loved one is able to live life to the fullest! When they are staying with us, they will no doubt feel like royalty. We will attend to all of their needs while helping them restore their independence and self-reliance. This is extremely important. Just imagine when you cannot remember anything and anyone. Think of how hard and confusing it can be. For this reason, we put a lot of effort to taking care of your loved ones. We are extremely patient, caring, and loving! You can have peace of mind when you have us to take care of your loved one. An important part of our service is the fact that our main goal is to improve their quality of life. As you can imagine, it can be hard to live a normal life when you simply cannot remember. We have a wide array of different treatment options that have proved to be successful. Even though we cannot cure Alzheimer’s or other memory related health conditions, we can help combat it in order to give your loved one that chance to live a normal life once again. 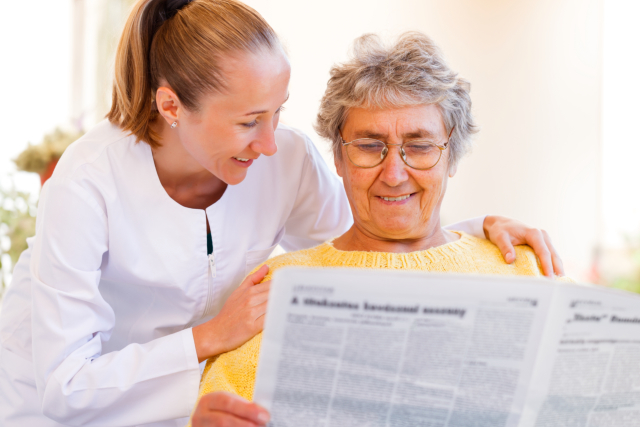 If you want to learn more about our services and how we are able to help treat your loved one who is suffering from Alzheimer’s while giving them the independence they deserve, please visit our website bradfordseniors.com for more information. Also if you still have questions for us, feel free to give us a call anytime at 618-624-0683. This entry was posted in assisted living, care services, health care, home care, personal care and tagged Alzheimer's Care Options, care services, health care, home care, personal care. Bookmark the permalink.